Fox introduced the Float DPX2 rear shock last year to fill the niche between the more Downhill-oriented Float X2 shock, and the more Trail-oriented DPS shock. 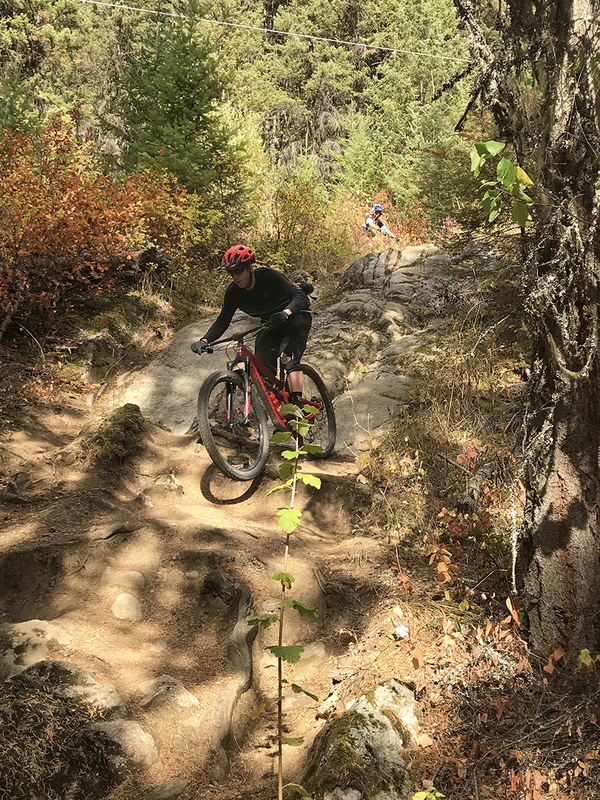 This was a spot previously filled by the Float X, but the DPX2 sees a whole bunch of changes and improvements that make it a prime choice for the “All Mountain” category of bikes. You’ll likely see DPX2’s spec’d on quite a few bikes with ~150 mm travel. I spent a few months with the DPX2 bolted to a Santa Cruz Hightower. In stock form, that bike came with a Rockshox Monarch, and as I noted in my review, I struggled a little bit to get the suspension dialed to my liking. So I bolted up the DPX2 to see how it fared on a bike with a suspension design that’s notoriously fussy. The Fox Float X was a solid unit — I rode that shock on a number of different bikes and got along with it pretty well. So what does the DPX2 bring to the table to improve upon the Float X design? For starters, the shape is slimmed down. There’s more room on both ends of the piggyback, which might not seem like a big deal until you’re trying to cram a piggyback shock along with a water bottle into a size Small front triangle. There are plenty of bikes that don’t have water bottle mounts, or sometimes don’t even offer a size Small (e.g. the Yeti SB5.5) because there isn’t enough real estate inside the front triangle. The DPX2 does everything it can to afford as much space as possible while still offering the ride qualities of a piggyback shock. Perhaps the most important visible feature of the DPX2 is that it’s more adjustable than the Float X. The current Float DPS shocks and the older Float X shock have a three-position lever (open / medium / firm) and then an additional three-position knob that adjusts low-speed compression in the open mode. So basically, with those shocks, you can make some macro level changes depending on whether you’re riding uphill or downhill, and you can do a little bit of tweaking to dial in the open mode, but on the whole the shocks aren’t overly adjustable. On the other end of the adjustment spectrum is the Float X2, which has independently adjustable high and low-speed compression, as well as high and low-speed rebound. That’s essentially the same damper as the DHX2. The DPX2 splits the difference between the Float X2 and the DPS. It has the three-position open / medium / firm lever, and single adjustable rebound knob like the DPS. But it gains a low-speed compression dial with 10 clicks of adjustment, similar to the X2. That low-speed compression adjustment only affects performance in the open mode, so you can dial in the shock for downhill performance. In terms of what’s going on inside the shock, the DPX2 has a lot in common with the Float X2 and DHX2. 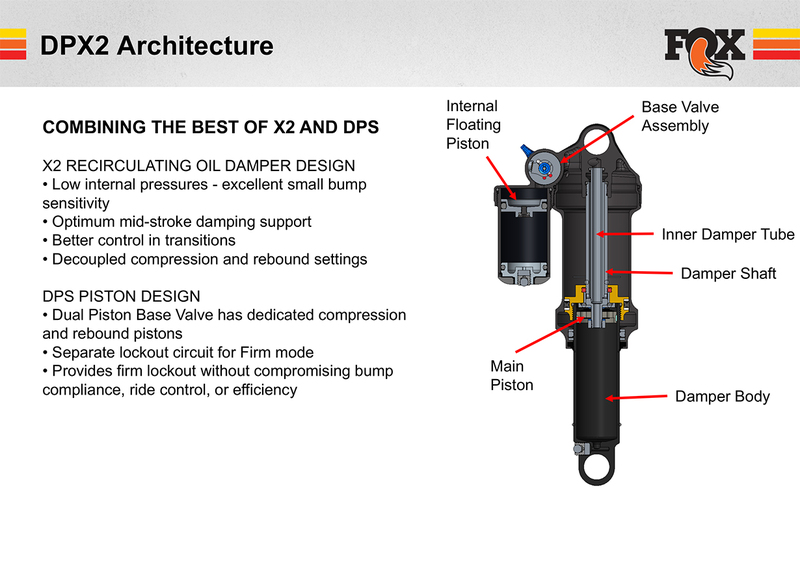 The DPX2’s compression and rebound circuits use what Fox calls the RVS, or rod valve system. It uses a needle valve of sorts for the low-speed circuits, and a shim backed by a spring for the high-speed circuits. This isn’t a new design, nor is it unique to Fox shocks, but Fox has been dialing in this system for a while now. The goal is to dissipate heat effectively and minimize hysteresis. In other words, we want to keep the shock cool, because as the oil inside gets hot, damping performance degrades. And we want the shock to perform smoothly in all situations; high hysteresis means the shock is doing something undesirable as it changes directions. Minimizing drag from the shock’s seals and designing the valving to work well as the shock changes from compressing to rebounding reduce hysteresis, which makes for a more sensitive shock that stays supple in all situations. For the air spring, the DPX2 gets an upgrade over the Float X by way of the EVOL air sleeve. 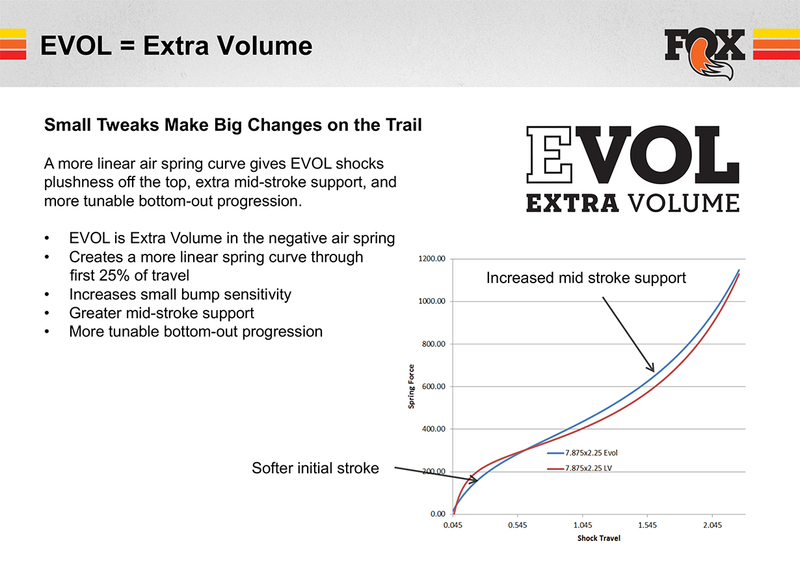 Compared to the old air can, the EVOL air sleeve provides a more linear rate early in the shock’s stroke which improves small-bump sensitivity. But it also increases mid-stroke support to help hold the shock up on medium-sized compressions. And of course, like most air shocks on the market these days, the DPX2 accepts volume reducers so you can dial in how progressive the air spring is. Like I said at the outset, I rode the DPX2 on a Santa Cruz Hightower that came with a Rockshox Monarch. While I’ve generally gotten along with the Monarch alright on other bikes, I couldn’t quite get it to ride like I wanted on the Hightower. My main issue was that, while the bike pedaled incredibly efficiently, it wasn’t great in terms of small-bump sensitivity. Particularly in rough corners, I struggled to keep the rear tire hooked up — it’d break traction too easily because it was bouncing around off of little roots and rocks. My bandaid solution with the Monarch was to lower the pressure and add some volume reducers to (try to) keep the shock from bottoming out with the lower air pressure. And while that helped, there was still plenty of room for improvement. So I bolted up the Float DPX2 to see if a different shock could help the situation. And yeah. It did. And not just a little bit, either — it was a fairly significant improvement. The most obvious change simply came from the adjustable low-speed compression. After setting sag, I could play with the compression setting to balance out small bump sensitivity vs. cornering support and pedaling efficiency. Since the Hightower is a pretty dang efficient bike just by virtue of the suspension design, I ended up running relatively little low-speed compression just to help out that small-bump sensitivity issue. But the beauty of the DPX2 is that with a 3 mm wrench and a couple clicks on the dial, I can significantly transform how the shock rides. The other fairly noticeable difference compared to the Monarch is that the DPX2 is just smoother in pretty much all situations. Compression adjustments notwithstanding, the DPX2 is less sticky over small bumps, and the damping feels a bit more controlled. I ended up running a mid-sized volume reducer in the DPX2 to get a bit more ramp up at the end of the travel so as to avoid bottoming out on bigger hits. Compared to the Monarch, though, I was running significantly fewer volume reducers (I was running the max in the Monarch). I tend to ride with the DPX2 in “open” mode pretty much all the time. I’ll occasionally pop it into the middle setting for a fire road climb, and maybe switch to the firm mode when a climb gets legitimately steep and miserable. But for the most part, including 90% of the climbing I do, the shock stays open. That said, I spent a little time in the middle and firm positions of the DPX2 just to see how they performed. The firm position is slightly softer than you’ll find on some other shocks, meaning that, while the shock gets quite firm, it still allows a little bit of movement at the beginning of its stroke with relative ease. I think this actually makes the firm position far more useful since you gain pretty much all of the efficiency advantages, but there’s just enough movement to maintain traction on more technical climbs. Similarly, I was fairly impressed with the middle setting — the small-bump sensitivity is quite good, but it gains a lot of support through the middle and end of the stroke. So for pumpier, flowier trails, the mid stroke keeps you from diving deep into the shock’s travel, but when you come up on some roots or chunkiness, the shock moves relatively easily at the beginning of its stroke so as to maintain traction. On longer, rougher descents, I can’t say I ever noticed the DPX2’s performance changing as things heated up. After some sustained, rough descents I grabbed the shock to see how hot it was getting, and while it definitely got warm, it never got nearly as hot as a non-piggyback shock running the same trail. I’m sure a heavier rider on a long descent would be able to get the unit pretty toasty, but at least for my purposes, the DPX2 handled everything I threw at it with grace. More to the point though, I never noticed any deterioration or changes in the damping performance, even on long descents. On descents that were long enough for my brakes to start fading, the DPX2 was still happily doing its thing. I have somewhere in the neighborhood of 400 miles on the DPX2, including quite a few lift-served and shuttled laps that have put it through the paces. Aside from wiping the shock off periodically, I’ve done absolutely nothing to it, and it’s still in top-notch shape. Everything’s still running smooth and quiet. I don’t have any particularly compelling complaints about the DPX2 — it’s been a great upgrade to the Hightower, and it’s done pretty much everything I wanted it to. That said, there are two things that I think could be improved. First, the detents on the 3-position knob are pretty subtle. 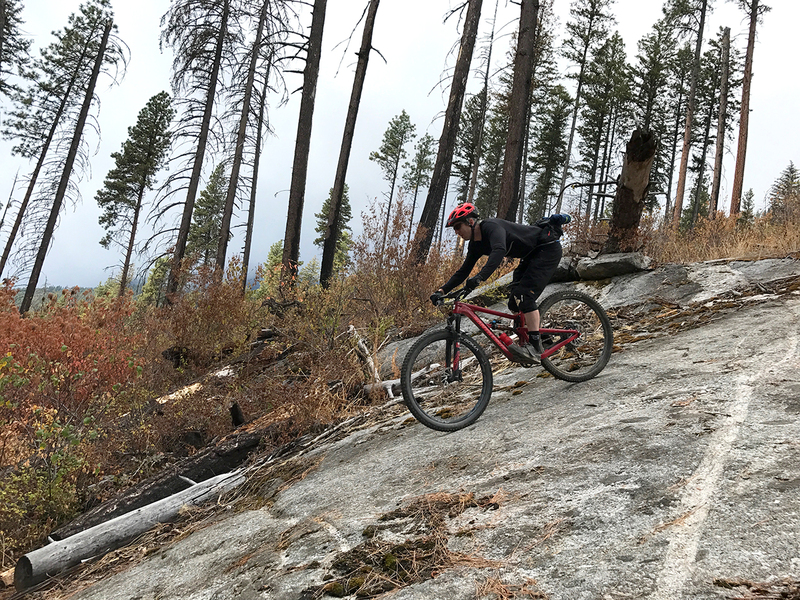 While riding along on the trail and trying to quickly flip the switch into the middle position, it can be tough to feel the “click” in that middle setting. This isn’t a problem in open or firm mode — you just thumb the switch all the way in one direction or the other. The other thing I’d change would be to put a slightly more substantial bottom-out bumper in. On a couple of hard hits where I got to the bottom of the stroke, it felt a little harsh. Some other shocks (including plenty of Fox shocks) seem to hit bottom a little softer. I should note that the width of the shock isn’t something that I have an issue with. When I first saw the shock, it looked like the damper was kind of wide, and might be something I’d smack my knees on. That hasn’t been an issue at all. As bikes get more capable, more and more people are riding shorter-travel bikes the same way they were riding big bikes a few years back. 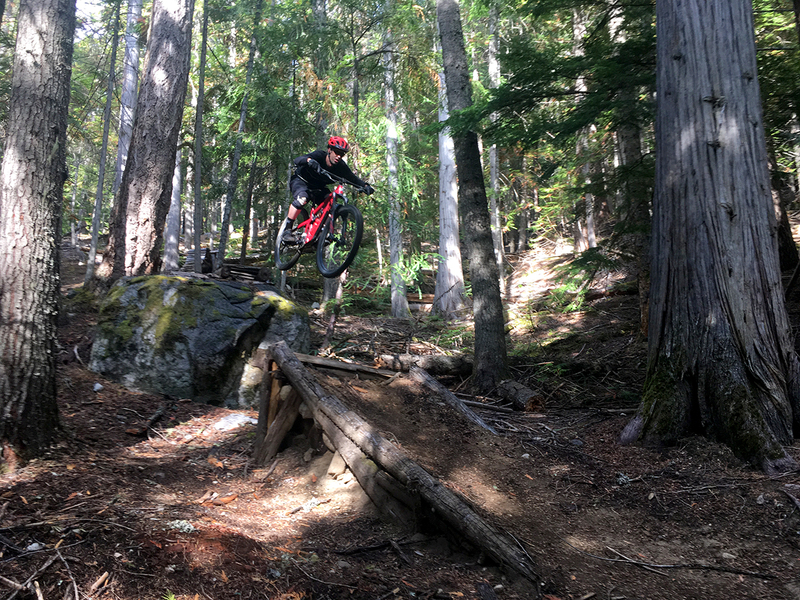 Trails full of rock gardens, drops, and big jumps are getting sent with speed by people on bikes with 130 mm of travel or less, when just a few years ago, those trails were mainly being ridden on DH bikes. But as bikes (and riders) become more capable, the suspension needs to keep pace, and the Fox Float DPX2 does just that. The DPX2 is coming stock on plenty of 150-ish mm travel bikes, and it’s the perfect unit for that sort of bike. But in terms of upgrades, I think it’s shorter travel bikes that are being ridden hard that are prime candidates for the DPX2. It’s the perfect option for people on smaller bikes that want (or, perhaps, need) serious performance on the descents. The Fox Float DPS shocks are obviously lighter, and the Float X2 shocks offer more adjustability and all-out downhill performance. But in the middle sits the DPX2, and it’s kind of the best of both worlds — a good bit of the X2’s DH performance, but in a lighter weight, more pedal-friendly package. And so if you’re on a mid-travel bike and you’re riding it like it’s a longer-travel bike, the DPX2 might be one of the better upgrades you can make. Have to agree with you about the monarch on the Hightower. What factory tune did you use on the dpx2? Nice review. Agree on all aspects, except mine definitely does NOT bottom harshly. When I use all the travel, I never know it until I get home and check the travel o-ring. Yours might be ready for an off-season refresh at the Fox Shock Recuperation Center. I’ve got a solid 200 hours on mine (mounted on a Fuel EX), it it still seems as good as new. I typically kind of destroy the performance of any shock in 100 hours or less. One less thing to hassle with! On the Fuel at least, it’s so easy to swap volume reducers that I’ll swap them around for different types of riding (home, Bend OR, and Moab typically). Less than 10 minutes, without unbolting the top or bottom of the shock. A great bonus. I am having a hard time deciding between the DPX2 and the X2 to put on the Pivot 5.5. 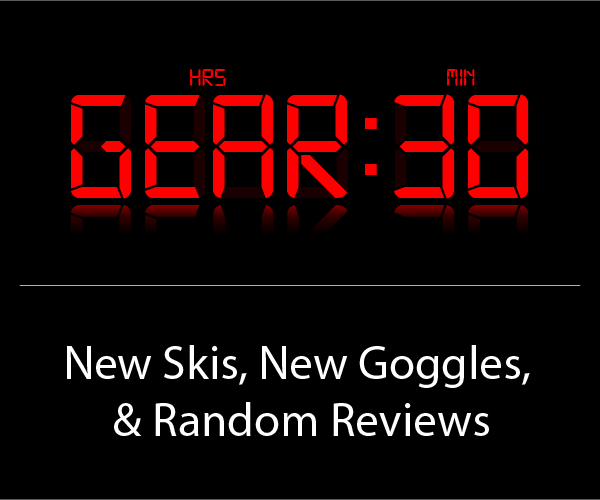 I’m 210 pounds geared up and I really enjoy climbing and want to maximize climbing efficiency. I enjoy a speedy downhill with lots of turns and curves with the occasional jump/drop, nothing too crazy though. My biggest concern is getting the right shock for a bigger rider. If you want to maximize climbing efficiency, I’d lean towards the DPX2. The X2 is a fantastic shock, but it prioritizes a more active suspension that levels out the trail, at the cost of some efficiency. And I think either shock would work alright at your weight; it’d come down to the leverage ratio on the 5.5, but I’d be very surprised if you were at risk of maxing out the air chamber in either of those options.